It is a famous meeting spot and a fun and safe playground for both families and kids. The water features available within the park are wonderful; offering entertainment to both adults and kids. Other features like Flying fox, sound chimes, track ride, rope-bridge, slides, play houses, storytelling areas and see-saw are available within the park. Beside these, the park has a café where you can quickly take a bite to fill up your hungry stomach. The playground is open all the year around, including public holidays and weekends. Certain sections of the playground are closed until midday on Tuesday and Thursday because of maintenance work. All children visiting this park must be supervised by an adult all the time. Running in the splash area is prohibited. Skateboards, roller blades and bikes are not allowed. The park has barbecues, picnic tables, event lawns and on-site café as well. The barbecues are available for private parties as well. 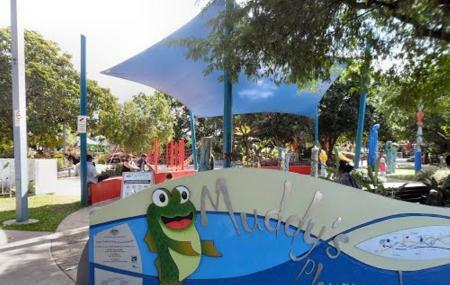 How popular is Muddy's Playground? People normally club together Tjapukai Aboriginal Cultural Park and Skyrail Rainforest Cableway while planning their visit to Muddy's Playground.